Sometimes the prototype is exposed with the __proto__ property, although this is not part of the standard. According to the EcmaScript specification, it is a private property. A cool (but also dangerous) thing is that a reference is kept to MyClass.prototype, so you can add methods that work on *this* to MyClass.prototype later, and they will show up on every instance of MyClass, being shared by all of them. Of course, since MyClass.prototype is an object just like everything else, its chain ultimately falls back to Object.prototype. To implement classical inheritance, you have to leverage the prototype chains. 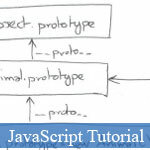 Since properties and methods are searched on an object's __proto__, if you want it to inherit from another object you have to modify the prototype of its class (you can't modify __proto__). Each instance of Dog now will inherit member fields from the new Animal() and consequently from Object.prototype. This prototype chain can be technically extended as long as you want, each time by setting the prototype of the subclass equal to an object of the parent class. Of course from you should be wary of endless hierarchies. This is the full code implementing these examples.